Shoko and I have made our spring trip east this year, so we won’t be going to see Milan-San Remo this time around, I’m afraid. But hey, bike races are better on TV anyway (as always, check Steephill.tv for live listings). This year’s route is just like last year’s, and the year before, etc., etc., but here it is anyway. At nearly 300 km, Milan-San Remo is the longest Classic (and first) of the season and is also one of the only that a sprinter can win (like Matt Goss last year), since the hills are small and attacks don’t always stick. Strategically, it’s very interesting because a puncheur, like Phillip Gilbert, can win it by attacking on the last climb of the day and hope he gets enough of a gap to hold out; a sprinter can hope that Gilbert doesn’t attack and win in a bunch sprint; and a powerhouse like Cancellara can simply drive away from everyone after the climb (or on the decent like I think he did when he won it) and crush the field just because he can. I’m going to make a prediction this year: Tom Boonen, although it’ll probably be Cavendish…What can I say? I like a comeback story. For a great look at all the Spring Classics, try this book. 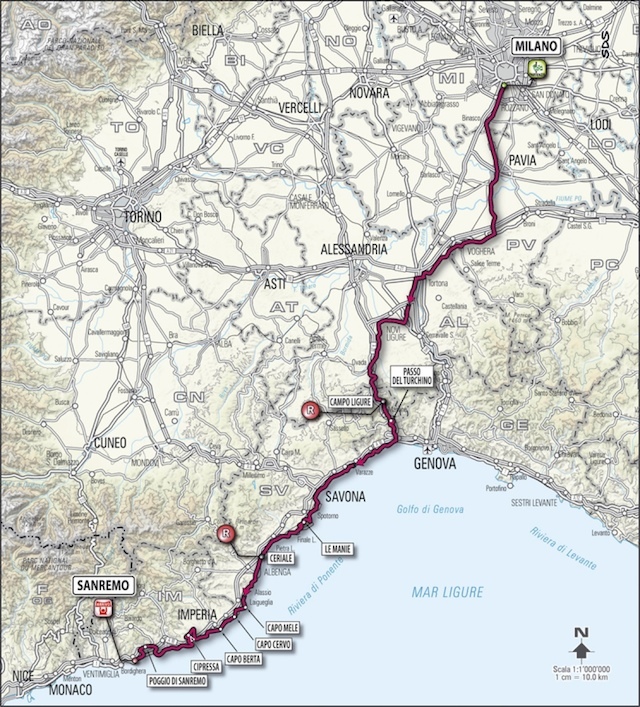 This entry was posted in Cycling and tagged milan-san remo 2012 route map. Bookmark the permalink. I don’t have enough confidence to make that bet. He looks good. I think I need Eurosport on satellite! You can’t get Eurosport online there? I paid 5 Euros a month during the season last year and got all their stuff live. Maybe that’s why I like him! And he’s as big as a short Power Guard in the NBA. Not quite the body type for a typical cyclist. Gotta love when the big guy (by any standard) can pull of a victory after 300kms of hard racing. Good point Roan, but given his history, I’m sure he has handlers now that ensure he stays clear of the Milano night club action. That said, if Cav is anywhere in sight at the end, he’ll win. Thank you for the useful links. Not sure anyone wants it more than Cav. He’s been tweeting about this very race since December. If he wins I’m going to start tweeting about the Specialized McLaren I saw in Nice last weekend! So much for Cav and his McLaren… I think Gerrans should give half his winnings to Spartacus. I feel for Cancellara. He’s such a marked rider. I guess he just needs to go faster.